Dussehra is one of the major festivals celebrated in our country with great zeal and enthusiasm. People all over the country participate in the occasion in their own way. It is THE day when Lord Rama killed the ten headed demon king Ravana and gave the throne of his kingdom Lanka to his brother Vibhishana. Thus, this day symbolizes victory of Good over Evil. “Rajasthan Pragati Samaj” and “Dussehra Sammelan Samiti” organizes a 10-day “Ramayan Mela” on account of Dussehra at Hyderabad, Telangana every year to create awareness about the Indian culture. This year too, the “45th Ramayan Mela” was organized in September 2017 at Exhibition Grounds, Nampally, Hyderabad, Telangana. 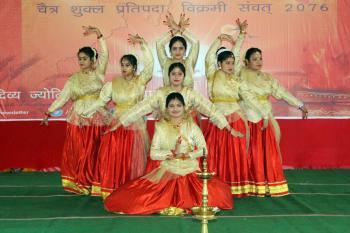 Divya Jyoti Jagrati Sansthan (“DJJS”) was again invited for the 5th consecutive time to participate in the program. 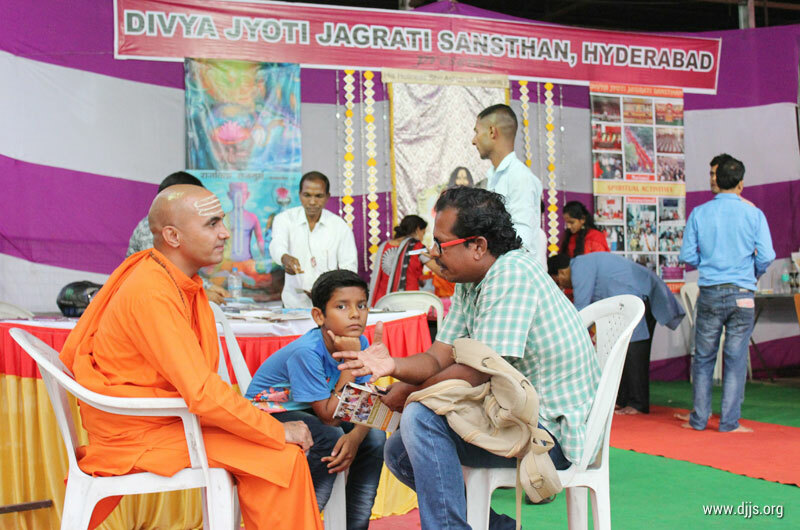 A day long exhibition of socio-spiritual activities was set up by young volunteers of Hyderabad Branch of DJJS on the final day of the event, i.e. 30th September, 2017. Through this stall, spiritual publications of Sansthan were distributed to the visitors at the stall. 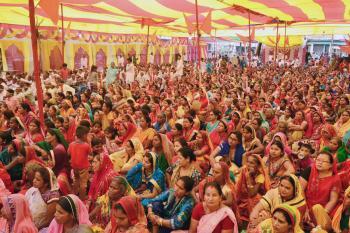 Many people enquired about the Sansthan and its activities. 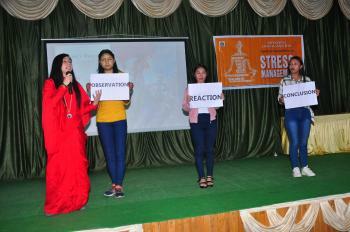 People appreciated the organization’s work towards society. “Mahayogi ka Maharahasya” book was gifted to Shri Bandaru Dattatreya, Ex-Union Minister and other Guests. 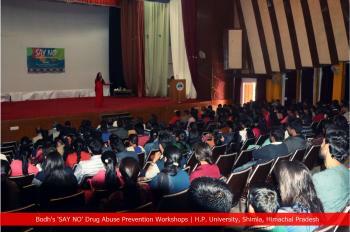 More than 2000 people attended the event. Swami Pradeepanand Ji (Disciple of Shri Ashutosh Maharaj Ji – Head & Founder of DJJS) from Chennai branch was invited as Guest to the program. Swami Pradeepanand Ji addressing the congregation said that Dussehra festival symbolizes the victory of Truth over Untruth, Light over Darkness and Wisdom over Ignorance. Even today after burning the effigy of Ravana along with his subordinates Meghanad and Kumbhkarana on the Dusshera celebrations, it simply symbolizes that the power of goodness and humanity is above all kind of powers. 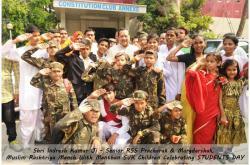 This day symbolizes as not only the victory of Rama but also the victory of mankind. That is why this day is held in high regard by people who believe that whenever will be chaos in the society and evil will try to take over humanity; God will appear in the form of a saviour to protect his devotees. 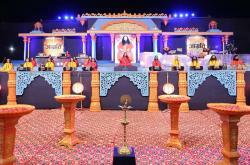 This festival inspires us to conquer our lower nature by the power of Divine Knowledge bestowed by a True Guru. 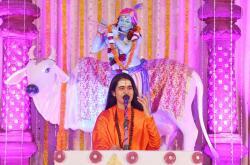 Swami Ji further explained that one should be alert in choosing a right Guru and be wary of imposters posing as Guru. People land up choosing an imposter when they want their worldly desires fulfilled from a Guru instead of desire to seek God. Elucidating the signs of a God realised Guru and giving reference from scriptures, Swami Ji clarified that “a Spiritual Guru is the one, who Himself is attuned to Almighty and has the apt capacity and capability to practically show and make one realize the True Self (Atman) within oneself. Acting as our Spiritual Guide and a trusted counsellor, he guides us during our spiritual journey. If you are really thirsty for God, you are bound to reach a perfect master today or tomorrow”. Shri Ashutosh Maharaj Ji is one such Spiritual Guru, who is benignant & imparts ‘Brahm Gyan’ to the genuine Spiritual aspirants. By His grace, lakhs of inquisitives have directly experienced the supreme within, thus commencing the journey into the inner realms of their Self. His potent directions reconcile worldly and the spiritual life of an aspirant, who then enjoys each moment of his blessed life. 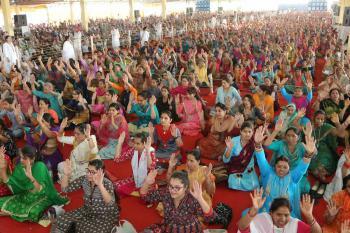 People appreciated the spiritual activities and social welfare programs of DJJS. 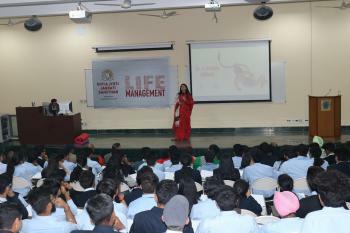 The program was thus successfully concluded thereby delivering the message of Divine Knowledge (Brahm Gyan).